More than a year after licensed producers started buying and selling cannabis on Cannamerx Cannabis Mercantile Exchange, dealings remain thin with the amount of sold product making up just a fraction of what was offered up for sale. Despite the national supply shortage, these low volumes challenge legal weed’s ability to trade like an agricultural commodity. “There are qualitative, quantitative, and temporal imbalances in supply and demand that frequently prevent market clearing,” said Dietwald Claus, Cannamerx chief executive and founder. 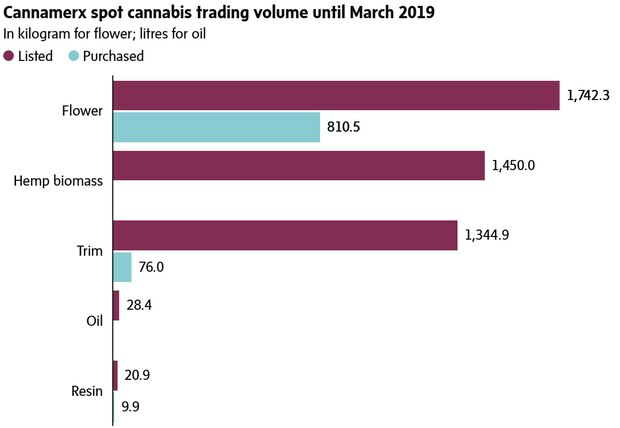 But Cannamerx aims to increase volume in this young market, and earlier this month added CBD and hemp to its list of cannabis products that can be traded on its platform. It plans to enter the U.S. market on hemp and hemp-derived CBD now that these products are federally legal there, Mr. Claus said. “Cannabis is a complex commodity – not all units of cannabis are equally fungible [unlike, say, oil]. Buyers look for particular characteristics in the product they would like to purchase, and those characteristics may not be met by the product that’s for sale,” Mr. Claus said. Since Cannamerx launched 16 month ago, roughly 887 kg of cannabis flower and trim have sold on its platform. This is nearly 30 per cent of what was offered, its data show. Hemp biomass, and cannabis resin and oil also trade through Cannamerx. Cannamerx increased its participant list to 60, the company said. Average listed offers of dried flower on Cannamerx’s spot market since November, 2017, have ranged from a low of $3.20 per gram in March 2018 to a high of $9.50 per gram in August 2018. Despite the nationwide shortage of recreational pot, the average unit price fell to $4.09 in February, 2019, before rising to $5.80 this month. Bids for future delivery of dried flower with THC levels 20 per cent and higher changed little over the past year-and-a-half, despite the country-wide shortage and strong demand seen at the retail level. Cannamerx data show the average bid for this product was $3.62 per gram for this month, but dips to $3.49 in June 2019 and returns near current levels to $3.63 for the last three months of 2019, appearing to shrug off small supplies. When Cannamerx expands to include U.S. participants, companies there will list prices in U.S. dollars and all trades will run through the same platform, though each company will only be permitted to buy or sell in accordance to their specific jurisdiction and licenses. “For example, a Canadian cannabis company can allow foreign companies to bid on their products, but the system would only allow companies from jurisdictions that allow the import of cannabis to actually bid on the product, and only if their license allows the purchase of the specific cannabis product in question,” Mr. Claus said.